From the main station in Munich, take the Regional Express toward Passau main station and transfer at Plattling station. From there, take the regional train to Ludwigsthal. Take the A92 from Munich to the Deggendorf junction and then follow signs to Bavarian Forest National Park - Zwiesel. Follow the National Park (B11/E53) signs toward Patersdorf and farther to Regen. At the end of the main thoroughfare, Ludwigsthal, you'll reach the parking lot at "Haus zur Wildnis". You can reach Ludwigsthal with the Falkenstein bus of the company Lambürger from Zwiesel station. In the area of the Bavarian Forest National Park and Nature Park you can use the "Bayerwald-Ticket" for public transportation. It replaces all the individual tickets and is the most flexible way to travel, as it is valid for all forms of regional public transportation. Visit the National Park Information Centre Falkenstein and learn all about the Bavarian Forest - Germany's oldest National Park. It's a great destination for the whole familiy - in summer but also in winter. The Bavaria Forest National Park directly on the border with the Czech Republic was founded in 1970 and was the first National Park in Germany. Within this vast stretch of land the possibilites are endless. For those who love nature and adventure - this is the best place to be. Discover the “Haus zur Wildnis” visitor centre, the animal enclosures and the Stone Age cave. The animal enclosures are open throughout the year and are always accessible. Maybe you're lucky and see owls or a Lynx. Several exhibitions, a large 3D cinema, a playroom, a shop and a restaurant await guests in the visitor centre. The entrance is free! The nature left to themselves - this is the philosophy of all German National Parks. Visitors are welcome - if they play by the rules: Please stay on marked trails and do not bother the animals! There are over 300 km of clearly-marked hiking trails navigating the fascinating forest. Experienced hikers can explore even more tempting places by taking the special experience trails. These trails will enchant you with giant trees, babbling streams, the smell of mushrooms and decaying wood, as well as the coolness of the moss on the forest floor. Another option is to take a bike ride through the park. Along the way, you will not only admire nature, but also may encounter a wide variety of animals. If you are interested in learning even more about the park to enhance your experience, you can book a guided tour with a trained forest guide. You will be amazed, what you can find. You will experience a picturesque snow landscape here in the winter months. Possible fun activities are cross-country skiing, snowshoeing in the forests and sledding down the mountain. They also offer guided snowshoe tours along isolated, snow-covered trails. "Bärwurz" - a high-percent Schnaps - is the national drink in the Bavarian Forest. He is made of native medicinal plants. Zwiesel is called as "the glass city". Glass artists, glass artisans and glass factories deliver insights into the traditional art of glass production and finishing. You will get to experience how they masterfully combine creativity with precision in their magnificent work. The Silberberg in Bodenmais offers the full leisure program: summer toboggan run, adventure playground, chairlift, ski resort and even a historical visitor mine. Highlight: Adventurous couples can even marry in a tunnel of the mine. The Großer Arber (1,456 m) is the highest mountain in the region. Make a hike (delicious blueberries grow at the edge of the path in summer!!) or take the ropeway - the view from the top into the valley is breath-taking. 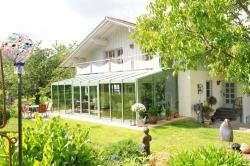 This luxury holiday home and apartment are situated in the Bavarian Forest, 3 km from Zwiesel. Guests are welcome to use the sauna or garden pavilion with lake, barbecue area and children’s playground. This 4-star hotel is located near the health resort of Zwiesel in the Bavarian Forest Nature Park. The family-run Bavaria Hotel has a romantic restaurant serving Bavarian and Mediterranean specialities as well an an indoor pool and spa area. Centrally yet quietly located on the edge of the Bavarian Forest in the scenic town of Zwiesel, this aparthotel is situated on spacious grounds and offers warmly decorated apartments.